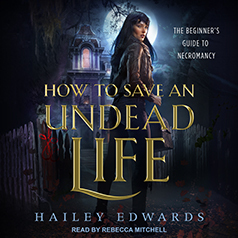 Hailey Edwards presents the first book in her Beginner's Guide to Necromancy series. Contains mature themes. Grier Woolworth spends her nights weaving spooky tales of lost souls and tragedies for tourists on the streets of downtown Savannah. Hoop skirt and parasol aside, it's not a bad gig. The pay is crap, but the tips keep the lights on in her personal haunted mansion and her pantry stocked with ramen.